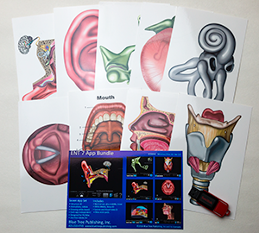 Transform your client education in clinic, in waiting rooms or even in classrooms for hearing awareness programmes! 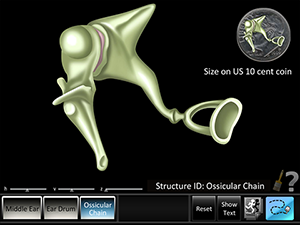 These apps provide detailed anatomy and function of the ear with animations bringing furtherclarity. The Audiology and Hearing computer apps package comprises 7 apps as follows. Includes 6 illustrative mini cards. The hearing app series covers the ear for youth and health fair audiences. 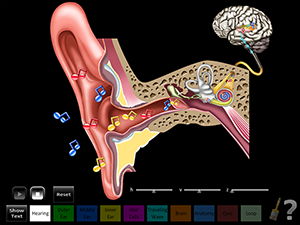 hearing anatomy, protection and sound. Designed for an interactive teaching environment, the app is perfect as a “show and tell” teaching aid. All animation can be zoomed, panned and sketched on. Example of use would be to project the app to a TV while the teacher narrates the story of Harry Hearing’s journey. uses such as museum displays, unattended health fair stations and clinic education. changes. Description text shows or hides on demand. Animations: all views include full color animations. Each app runs independent of the others. Designed for PC and Mac desktop computers. Programs requires free Adobe AIR, included on on install media. Tested for Windows 10, 8.1 - Mac OS X 10.X. Programs typically work with any system that AIR successfully installs to. Programs delivered via thumb flash drive. Not available as a download. 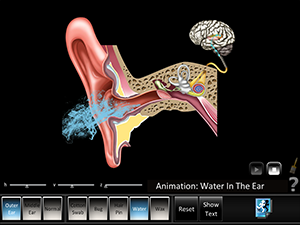 Screen grab from hearing anatomy - detail of all anatomy, with explanatory terms, plus animations of hearing function. 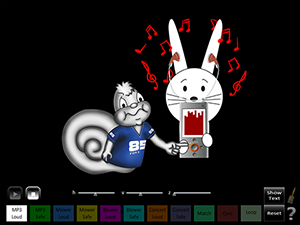 Screen grab from hearing protection - Harry Hearing is employed to help younger populations understand hearing function and protection.